Ideal for consistent screw driving into a variety of materials withdifferent screw sizes. DCF787 XR Brushless Impact Driver. Ultra compact, light weight design allows for use in confined spaces. Steel belt clip and strong magnetic bit holder ensure storage solutions. 18VOLT XR LI-ION 11 TOOL COMBO WITH DCB546 6 AH LI-ION FLEXVOLT BATTERIES. DCS391 CIRCULAR SAW INCLUDES TCT BLADE SIDE FENCE & DUST EXTRACTION ADAPTOR. DCP580 82MM PLANER INCLUDES DUST BAG AND SIDE FENCE. 3 x DCB184 18v 5.0Ah XR Li-Ion Batteries. 1 x DCL050 - Cordless Light. 1 x DWV9390 - Planer Bag. In Set inclusive 3 years warranty. 1 x DCS391 - Circular Saw. DCF610 10.8V XR Li-Ion Screwdriver. Powerful 10.8V Screwdriver for screwdriving & drilling applications. Compact, lightweight design. Heavy duty kit boxWarranty Specifications. Ergonomic handle and rubber overmold to provide ultimate end user comfort. 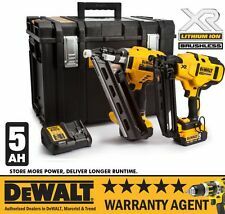 This Dewalt XR 5 Piece Kit, contains the following: 1 x 18 Volt DCD785 Compact Hammer Drill is compact 13mm single sleeve keyless chuck with automatic spindle lock for quick and easy bit change with one hand Bright white LED with delay feature for improved visibility and flashlight functionality. Improved ergonomic design and rubber grip improves user comfort Li-Ion slide pack battery allows for superior insertion and removal 1 x 18 Volt DCF885 Impact Driver is ultra compact, light weight design allows for use in confined spaces. All metal gearing for efficient power transmission and long tool life. 1 x 18 Volt DCS331 Jigsaw has a keyless blade change and intelligent variable speed trigger. Accepts T-shank blades. 1 x 18 Volt DCS391 Circular Saw with an intelligent trigger . Dewalt 18v 1/2" Impact driver and drill complete with 2 batteries and charger. Dewalt 18v 1/2" Impact driver and drill complete with 2 batteries and charger. Impact driver has a high torque. Condition is Used. Dispatched with Royal Mail 2nd Class. 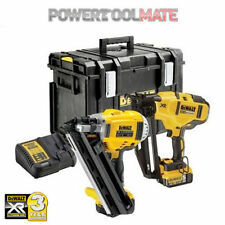 This Dewalt XR 6 Piece Kit, contains the following: 1 x 18 Volt DCD785 Compact Hammer Drill is compact 13mm single sleeve keyless chuck with automatic spindle lock for quick and easy bit change with one hand Bright white LED with delay feature for improved visibility and flashlight functionality. Improved ergonomic design and rubber grip improves user comfort Li-Ion slide pack battery allows for superior insertion and removal 1 x 18 Volt DCF885 Impact Driver is ultra compact, light weight design allows for use in confined spaces. All metal gearing for efficient power transmission and long tool life. 1 x 18 Volt DCS331 Jigsaw has a keyless blade change and intelligent variable speed trigger. Accepts T-shank blades. 1 x 18 Volt DCS391 Circular Saw with an intelligent trigger . The DEWALT DCK211D2T XR TSTAK kit features a 10.8V cordless drill and an impact driver. It includes two speeds and LED lighting. Product Identifiers. Product Key Features. Number of Tools. Lithium-Ion (Li-Ion). 1 x DCD795 Combi Drill. 3 x 4.0Ah Li-Ion Batteries. 20-Volt Compact Jobsite Blower - DCE100B. Compact, lightweight design fits into tight areas. 1/2" single sleeve ratcheting chuck provides tight bit gripping strength. Compact (5.55" front to back) design fits into tight areas. The item you are currently viewing is the Dewalt DCK550M3T Brushless 18V XR 5 Piece Kit c/w 2 x 4.0ah Li-on Batteries. • 2X 4.0AH Li-on Batteries. The DCK550M3T is a cordless kit comprising of •T-STAK I KIT BOX. 54V always gives more power, this will be more evident during harder applications. This increased power opens up applications that were previously not possible on cordless. The battery power output depends on which tool it’s plugged into. DEWALT DCK699M3T 18V CORDLESS LI-ION 6 PIECE POWER TOOL KIT 3x 4.0ah BATTERIES. 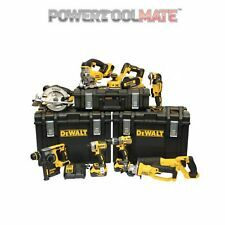 The item you are currently viewing is the Dewalt DCK699M3T 18v Cordless Li-Ion 6 Piece Power Tool Kit 3x 4Ah Batteries. The DEWALT DCK623P3 XR Brushless 6 Piece Kit, contains the following This is achieved through 3 motor speeds and torque settings. It has a super lightweight and compact design. 1 x 18V DCS570 XR Brushless Circular Saw, ideal for general purpose ripping, cross-cutting and bevelling, for wood and other construction materials. DEWALT 18V Cordless Drill and Impact Driver. 2 Batteries 20V and charger. Condition is Used. Dispatched with Royal Mail 2nd Class. DEWALT 20V Cordless Li-Ion 6-Tool Combo Kit - DCK695P2. Shipped with USPS Parcel Select Ground. 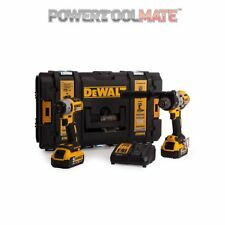 DEWALT 2-Tool 20-Volt Max Power Tool Combo Kit with FREE SOFT CASE !